Clinical trials are an important part of medicine and healthcare today, deciding which treatments we use to treat patients. Anyone involved in healthcare today must know the basics of running and interpreting clinical trial data. 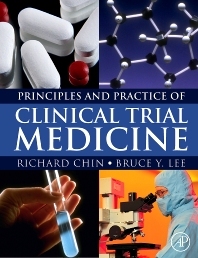 Written in an easy-to-understand style by authors who have considerable expertise and experience in both academia and industry, Principles and Practice of Clinical Trial Medicine covers all of the basics of clinical trials, from legal and ethical issues to statistics, to patient recruitment and reporting results. Richard Chin is the CEO of Institute for OneWorld Health, the first U.S. nonprofit pharmaceutical company and Associate Professor at UCSF School of Medicine. OneWorld Health develops affordable drugs for neglected patients in the developing world. Dr. Chin has extensive expertise in drug development, including over 45 INDs and almost a dozen drug registrations. His previous roles include CEO of a NASDAQ listed company, Senior Vice President of Global Development at Elan, and Head of Clinical Research for the Biotherapeutics Unit at Genentech. He was named by Businessweek in 2006 as one of the youngest 99 public company CEOs in the United States. Dr. Chin earned an M.D. from Harvard and the equivalent of a J.D. from Oxford, where he studied as a Rhodes Scholar. Dr. Lee is currently an Assistant Professor of Medicine and Biomedical Informatics at the University of Pittsburgh. He is also Core Faculty in the Section for Decision Sciences and Clinical Systems Modeling, the Center for Research in Health Care, and the RAND-University of Pittsburgh Health Institute. He is a Co-Investigator for the National Institutes of Health (NIH) Modeling of Infectious Diseases Agent Study (MIDAS) research and informatics network. His previous positions include serving as Senior Manager at Quintiles Transnational, working in biotechnology equity research at Montgomery Securities, and co-founding Integrigen, a biotechnology company. His consulting experience includes a large variety of clients, ranging from large and small pharmaceutical, biotechnology, and medical device companies. Dr. Lee has authored three books, as well as numerous research publications, review articles, and book chapters. Dr. Lee received his B.A. from Harvard University, M.D. from Harvard Medical School, and M.B.A. from the Stanford Graduate School of Business. He is board-certified in Internal Medicine, having completed his residency training at the University of California, San Diego.